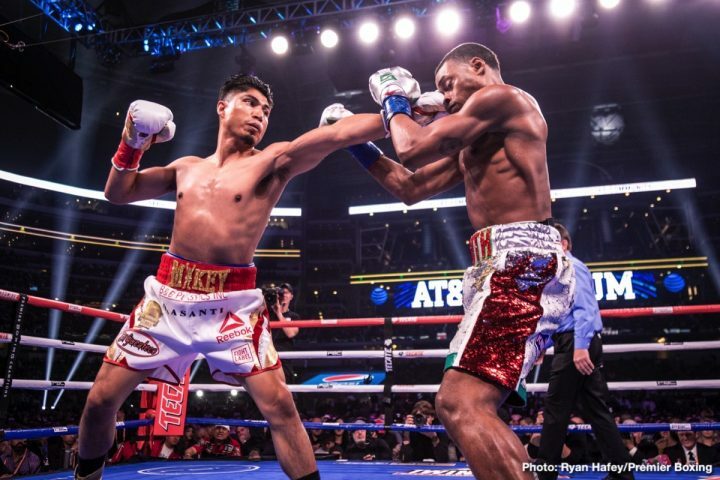 Mikey Garcia: "Errol Spence is The Truth, he's for real"
By Jim Dower: Errol Spence Jr. looked sensational in beating the previously undefeated Mikey Garcia in front of 47,525 at AT&T Stadium in 12 round unanimous decision victory in a defense of his IBF welterweight belt. Spence resembled former welterweight champion Terry Norris with the way he took the fight to Garcia (39-1, 30 KOs), forcing him to fight at a faster pace than he could physically handle. Ultimately, it wasn’t so much the size that got to Garcia, but rather than tremendous work rate by Spence, 29, that was the reason for his loss last Saturday. Garcia couldn’t keep up with the high pace that Spence set. Garcia’s Plan-B, which was for him to throw harder single shots, it wasn’t the answer to what Spence was doing. Spence’s tactics to win the fight wasn’t rocket science. He made it a point in going after Garcia in every round, throwing punch after punch, and sometimes throwing over 100 punches per round. When you’re talking about a fighter with the kind of power that Spence possesses, it’s intimating to try and stay in there with him when he’s throwing over 100 punches per round like he was doing at times last Saturday night against the 31-year-old Garcia. Spence’s victory over Garcia puts him at 25-0, and furthers the belief that many boxing insiders have that he’s the best in the welterweight division today. Had #2 pound-for-pound fighter Terence Crawford been inside the ring with Spence last Saturday night, he likely would have fared no better than Garcia, and maybe did worse. Garcia’s excellent punch resistance and his ability to pick off many of Spence’s shots allowed him to stay in there with him for the full 12 rounds. Crawford might not have been able to take the kinds of shots that Spence was landing, and he wouldn’t have been able to match his high work rate. Crawford is a low work rate fighter, who depends on his ability to counter his opponents with perfectly placed punches to win his fights. Against Spence, Crawford would likely be overwhelmed with punches, and beaten up even worse than Garcia was last night. Spence won on the scorecards by the scores 120-107, 120-108 and 120-108. Few boxing fans would have predicted going into the fight last Saturday night that Spence would beat a talented fighter like Garcia by such a wide score. They thought that if the fight went the full 12 rounds, Mikey would lose either a close decision or win by a decision. Two-time former heavyweight world champion George Foreman had predicted a victory for Garcia over Spence. Afterwards, Foreman admitted that he had it wrong. “Too much punishment for Mikey! When fighter get hurt,” Foreman said. “All the way it’s me; my fighter lost tonight; Spence fought skills I was not away of. Right Jab all night he is a good boxer. Great match; Spence has a big edge with that Jab and quick moves after he land a punch,” Foreman said in predicting a difficult fight for Manny Pacquiao if he faces Spence next. Spence fought like one of the legends of the sport with his performance against Garcia last Saturday. In hindsight, there wasn’t much that Garcia could have done differently to make the fight more competitive. If Garcia, 31, had increased his punch output to match Spence’s, it likely would have resulted in him being quickly chewed up by him with his superior engine. Perhaps what was Garcia’s undoing in the fight was all the added muscle weight that he’d packed on during training camp. The extra weight appeared to slow Mikey down, making his punches slower than they would have been had he not packed on the weight, and hurting his ability to fight as hard as he needed to for him to be competitive. Like a lot of fighters that bulk up for fights, Garcia’s cardiovascular system was unable to cope with the extra 10 lbs of weight that he’s put on for the fight. Mikey came into the fight last night in the 150s, and his conditioning wasn’t at the level that it needed to be for him to deal with Spence’s high work rate. It’s never easy for a fighter to handle a guy that throws over 1,000 punches, but the job is much tougher when they’re carrying around a lot of extra weight that they’ve just put on. Mikey’s decision to move up two weight classes to challenge Spence for his IBF welterweight title was based on him having spotted something in Spence’s game that he believed he could take advantage. Needless to say, whatever Garcia saw in Spence’s game that he thought he could capitalize, it turned out to a mirage. It’s possible that Garcia could have exploited this flaw in Errol’s game if he had the size, speed, power and high rate to take advantage of it. Unfortunately for Mikey, he had none of those things going for him last night. Garcia would likely lost last night anyway if he was just missing in one just one of those areas, but for him to be at a disadvantage in all four of those areas, he never stood a chance. Garcia made a mistake in not understanding his own limitations as a fighter going into this fight. He didn’t have the tools needed for him to pull off an upset against Spence, and the fight quickly unraveled out of control once Errol started throwing nonstop punches in the championship rounds. The beating that Mikey took from Spence was brutal. There’s rumor that Garcia suffered a jaw injury in the fight, which would’t be surprising given all the heavy shots he took. In watching the slow motion replays of some of the shots that Spence was hitting Garcia with, his jaw was being contorted badly. In the later rounds of the fight, Garcia was fighting with his mouth open, which could be an indication of a jaw injury and/or stamina problems from the heavy pressure that Spence was putting on him. The punishment Garcia took in the first five rounds wasn’t severe, but in the second half of the fight, it got really bad for him. When Spence upped his work rate in the final seven rounds of the contest, the fight was a one-way beating with Garcia taking punch after punch to the head and the body. The body shots seemed to bother Garcia a lot more than the head shots. The reason for that is Garcia was doing a good job of partially deflecting the punches to the head from Spence. But when Spence would go downstairs to Garcia’s midsection, he was hitting him cleanly, and with a lot of weight behind the shots. The body shots caused Garcia to wilt in the last four rounds of the fight. After the fight, the AT&T Stadium crowd were treated to seeing superstar Manny Pacquiao enter the ring, and accept a challenge from Spence in what appeared to be a half-hearted manner. The enthusiasm that the 40-year-old Pacquiao showed in accepting a challenge to face Spence next was that of someone asking if they wanted to go to the dentist for root canal. Pacquiao did not show the same kind of excitement he’d shown in the past when he was given a fight against Floyd Mayweather Jr. in 2015. Pacquiao’s body language didn’t match his words when he was asked if he wanted to fight Spence next, and he said, “Why not?” Mayweather spoke to Pacquiao briefly after the fight, and it’s unclear whether the two of them will wind up facing each other. Mayweather has got to know that it’s now or never. If he waits until after Spence fights Pacquiao, it probably won’t be worth making the rematch with him. If Spence knocks out Pacquiao, it’ll be pointless for Mayweather to sign on for a rematch with the Filipino star. The time for Mayweather to fight Pacquiao is now before he faces Spence. If Mayweather waits until after that fight, he’ll likely have lost his golden opportunity to make the fight happen. Money-wise, Pacquiao (61-7-2, 39 KOs) can get a good payday in fighting Spence, and he’ll be well respected in taking this fight. It would be a big upgrade for Pacquiao from his previous match against Adrien ‘The Problem’ Broner, who he beat by a 12 round unanimous decision last January.